One of the gems we have here in Ashland is our architecture. We are truly blessed to have the amazing structures we do, not to mention the many property owners who take pride in keeping their buildings preserved historically. It can be very expensive and time-consuming, and we truly appreciate their investment, both financially and physically. With that in mind, on May 13, we are excited about Ashland’s participation in this statewide event. The Wisconsin Economic Development Corporation is collaborating with other agencies on what they are calling a Downtown Open House. We are calling it the Ashland Architec-tour. Seven historic Ashland buildings will be open for tours from 10 a.m. to 2 p.m. that day. In addition, there will be a brochure offering a brief historical teaser about each building and a map showing where they are. There also will be several interpretive narrations throughout the time of the Architec-tour. Buildings included on the tour are the Ellis School Building, Stuntz Avenue Fire House, Soo Line Depot, Ashland County Courthouse, Clark & Clark Law Office (the old Security Savings Bank building), Northern State Bank, Ashland City Hall, the third-floor meeting room of the Masonic Temple, and the recently restored Wilmarth Mansion. In addition, there will be a fun Scavenger Hunt in historic retail businesses. Scavenger Hunt forms will be available from any of the open house locations. The Scavenger Hunt will take place in participating businesses and the winner will walk away with a $50 dinner gift certificate and $50 in Chamber Dollars. So get out and learn some of the fun history of our area. The Ashland Historical Society Museum will be open on May 13th and stores that have a historic background like the New England Store will have information readily available to see in their store. Did you know there is a bank vault inside the New England Store? Or about the old vault in the Clark and Clark building? These places are beautiful and played a major role in our history. Our hope is that this will turn into a full-fledged, self-guided Ashland Architecture Tour incorporating many buildings that are part of our history and continue to be part of our future. As we researched some of these buildings and talked to their owners, we found this incredible sense of pride in the exceptional architecture and building of these structures. Last year when we went through our re-branding exercise, we witnessed that same pride and a sense of community among our businesses and residents. The tourists see this as well when they visit. They see Ashland as a beautiful community, rich in history with an immense, emotional connection to our Great Lake and a huge sense of pride. I love that about our area! 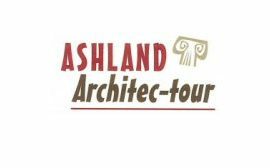 Listen to the Ashland Architec-tour ad. For more information, call the Ashland Chamber at 715/682-2500.